"Stop! Stop! Stop!" redirects here. For the song by that title and the last track on this album, see Stop Stop Stop. For the Nu Virgos album, see Stop! Stop! Stop! (album). 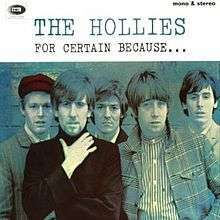 For Certain Because is the fifth UK album by The Hollies and their second released in 1966. This was the first Hollies album in which all the songs were written by members Allan Clarke, Graham Nash, and Tony Hicks. This was also the first Hollies album recorded with new bassist Bernie Calvert. Retitled Stop! Stop! Stop! for the US and Canadian markets and issued with a different, full-color cover image of the group in the US market, this was also the fifth Hollies album released in the US and Canada, although the third released in 1966. It was the first Hollies album on which the track listing for all of the US, the Canadian, and the UK versions remained the same; that would not happen again until the 1970s. In addition, other markets used the title Stop! Stop! Stop! when issuing or reissuing this album, including the UK, which retitled it as Stop! Stop! Stop! for a 1971 budget-line reissue. In 1983, Liberty Records in the US reissued this album as Pay You Back With Interest without the tracks "Stop! Stop! Stop!" and "High Classed". Stop! Stop! Stop! was the Hollies' last new album for Imperial Records in the US and for Capitol Records in Canada. Their next new album, Evolution, would be released in the US and Canada on Epic Records while remaining on Parlophone/EMI in the UK and would revert to having a different track lineup between the US/Canadian and UK versions. Most current CD releases of this album use the original UK album title and artwork, but a recent US CD reissue series instead uses the US title and artwork. Eric Haydock — bass guitar on "Don't Even Think About Changing"
Mike Vickers — orchestral arrangements on "High Classed", "What Went Wrong" and "Crusader"
↑ Unterberger, Richie. "Allmusic review". Allmusic.com. Retrieved 2012-06-30. ↑ "Discography". Hollies.co.uk. 1966-12-09. Retrieved 2012-06-30. 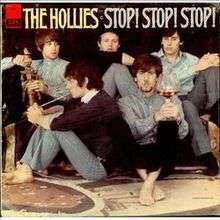 ↑ Official Hollies information page for Stop! Stop! Stop!